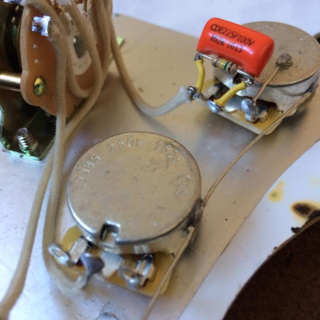 One of the major downsides of many modern guitar wiring setups is the frustration of losing the high end frequencies as the volume control is rolled down, resulting in a loss of brightness and a muddy, foggy tone. Thankfully, this is easily fixed by installing a treble pass capacitor (known as the treble bleed mod) into the circuit. As the name suggests, it reduces the amount of treble that bleeds to ground allowing the guitarist to lower the volume yet maintain the strong output (it is essentially like turning down the volume on the amplifier and losing little of the clarity and brightness from the guitar). A treble bleed circuit uses a small value capacitor and resistor that connects across the volume input and output lugs. Once installed in an active circuit, the capacitor only passes the high end frequencies. This guide will show you what you need and how to install it. 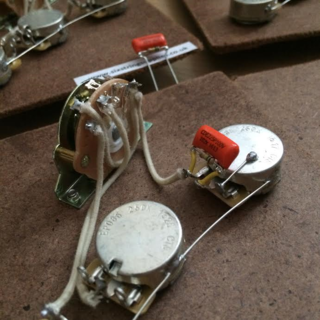 Alternatively, you can purchase a pre-wired treble bleed kit. Installation is simple. This mod is extremely effective yet costs next to nothing. The 150k resistor needs to be soldered between the two lead wires of the capacitor - you can either twist the resistor lead wires around the capacitor wires and solder, or you can snip the wires and solder. Either way, you need a connection between the two. Refer to the below photo. 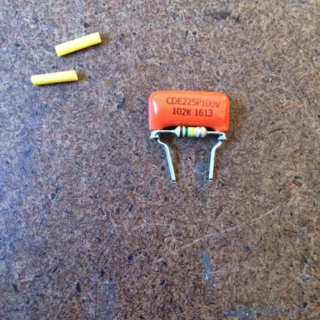 Quite simply, solder the treble bleed circuit to the input and output lugs of your volume control pot. Cut the capacitor leads to length, add the heat shrink tubing if you are using it (all this does is to protect the lead wires from coming into contact with the back of the pot, which acts as the ground) and solder into place as per the below wiring diagram. Our treble bleed kits consist of a 0.001uf orange drop capacitor and 150k resistor with the heat shrink tubing included ready to install into your guitar.